One random Sunday in San Francisco, I woke up with an awful hangover from a crazy night of drinking the night before. How on earth was I gonna remedy this situation? Then it struck me! Soup! And you know what, I had just the thing from my todo list that would fit the bill, pho at Turtle Tower. The restaurant’s name – Turtle Tower – sounds kind of ridiculous and it’s kind of fitting because it’s located right in the heart of the ill-reputed crack-riddled Tenderloin neighborhood. But in the midst of all of the rundown chaos and disorder it serves as a bright, large, Vietnamese, shining beacon of hope. The first move in the hangover elimination plan was to get a Vietnamese Iced Coffee called Café Nóng Ðá. I did this immediately because it takes a while to brew. 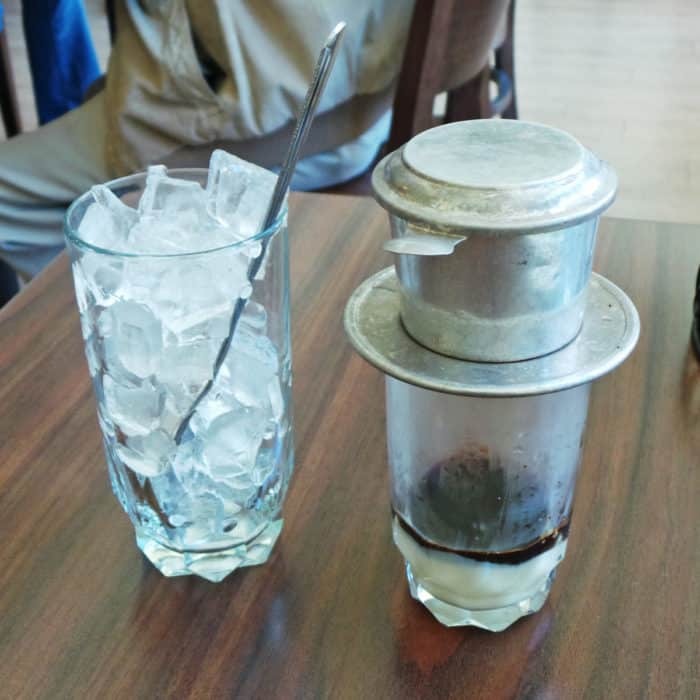 It came with a pool of sticky, sweet condensed milk huddled at the bottom of the glass with a bold, black coffee dripped over top. The strong coffee combined really well with the equally as potent sweet milk making a perfect breakfast beverage mixture. 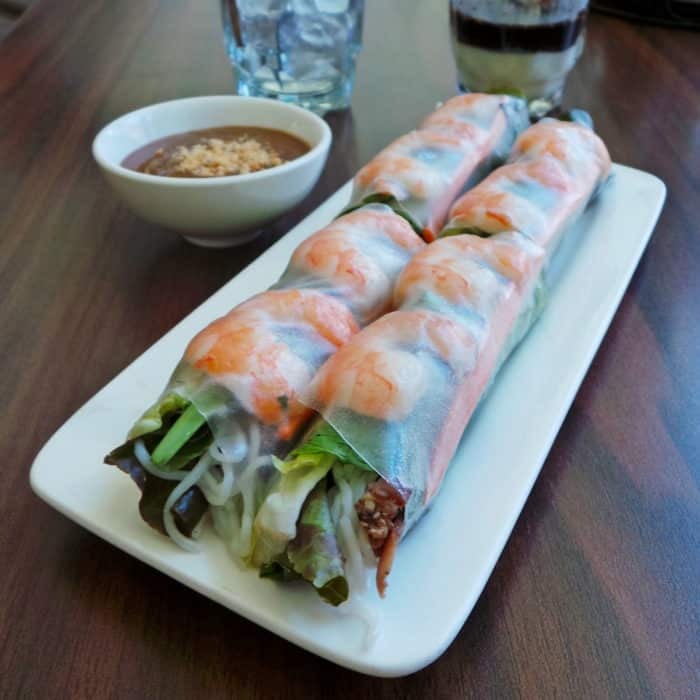 From there, I went for the Fresh Spring Rolls known as Gỏi Cuốn and I’ve gotta say, I think these were the best Vietnamese Spring Rolls I’ve ever had. They were really large and had a super sticky rice paper wrapper and were loaded with plenty of flavorful herbs, large snappy shrimp, and had a funky and flavorful hunk of meat inside. I don’t think I’ve ever had rolls with this sort of meat inclusion before, but I really loved how it transformed the flavor profile. A quick dip in the thick, brown, peanutty dipping sauce and these were perfect. And for the main event – the pho. When you think of pho, you probably envision a deep, dark, beefy broth with a variety of beef cuts floating throughout. Turtle Tower does serve beef pho like that but that’s not what you should get. 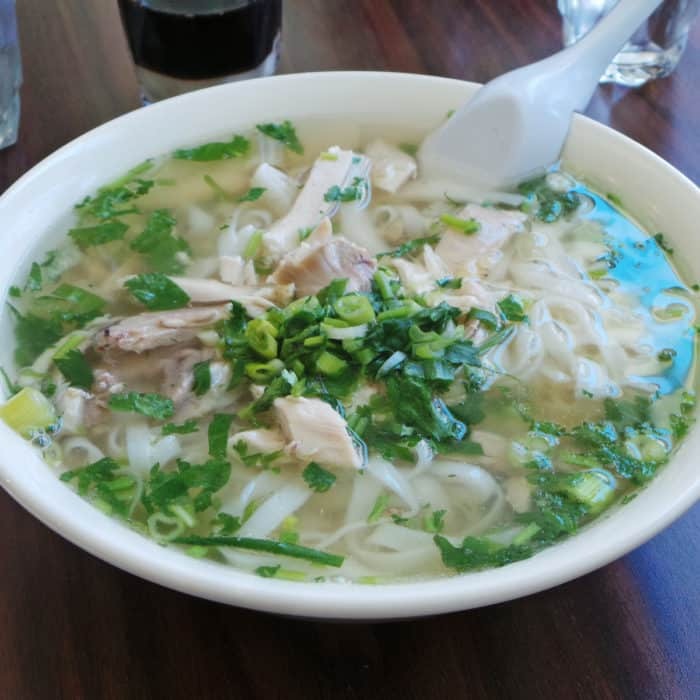 This restaurant specializes in a less common Northern Vietnamese pho variety which is much cleaner and tamer than its Southern Vietnamese counterpart. 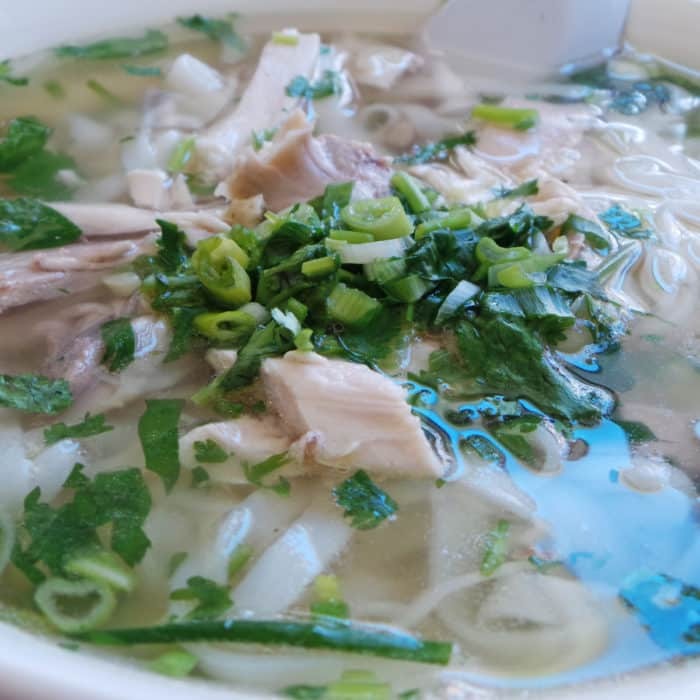 I followed the raving words of the entire Internet and went with the chicken-based Pho Ga on my visit. The broth was super clean, herbal, and was chicken-based. 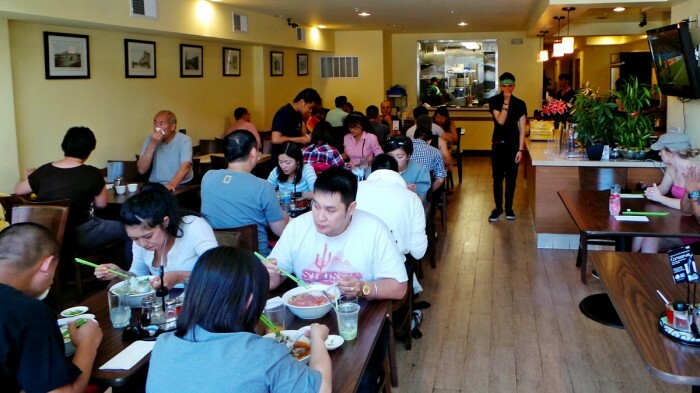 The noodles were a wide rice noodle variety, which also differed from the more spaghetti-like noodles you normally find in Southern Vietnamese pho. It came filled with a ton of super-tender, super-moist chicken meat some of which was served skin-on. 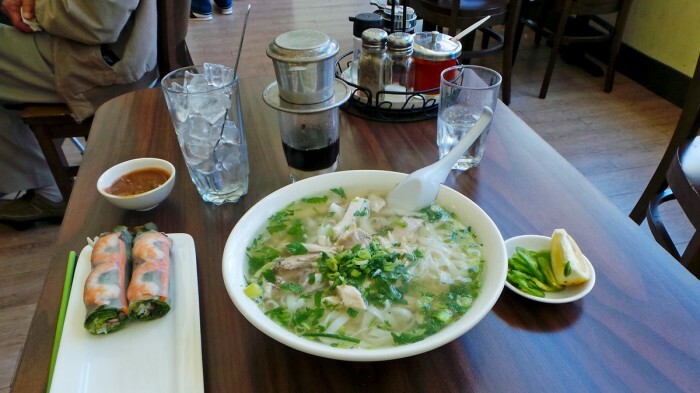 Another difference in this kind of pho is the types of condiments and toppings included. They do not offer dark brown plum sauce and also do not include bean sprouts or mint leaves with this soup. But, I didn’t mind that one bit. To doctor up this soup, I squeezed a bit of lemon juice and added a touch of red chile sauce to liven it up a bit. The whole thing was just incredible. It was really cheap, filling, satisfying, and flat out delicious. Honestly, this was exactly what I needed when I was feeling hungover and under the weather. 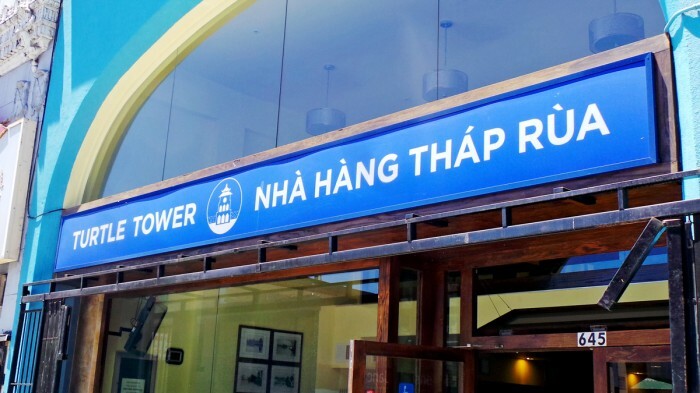 So if you’re in the mood for pho and want to try something that’s not just your run of the mill Southern Vietnamese stuff, head over to Turtle Tower. Everything they serve is cheap and fantastic, but especially that soothing and super comforting Pho Ga.
Got another incredible Vietnamese spot in San Francisco I should check out? Let me know in the comments below.